These exhibitions and events are affiliated with The University of Iowa’s commemorative celebration of the anniversary of the ratification of the Universal Declaration of Human Rights. Funded by the National Endowment for the Arts, The University of Iowa Cultural Affairs Council, Council on the Status of Women, Museum of Art, University Libraries, the Scholl of Music, Institute for Cinema and Culture, Theatre Arts, B’Nai B’Rith Hillel Foundation and Agudas Achim Congregation. Completed in the early 1970s, Boris Lurie's unsettling assemblage of knives, concrete, rags and torn underwear was initially titled The End of Revolution. As can be expected, there is little about Knives in Cement that is optimistic. Instead, in its unmistakable reference to perpetual carnage, the work is imbued with a tangible dystopian aura. A segment of this piece is currently installed in The University of Iowa Museum of Art's South River Gallery. Other components of the construction are concurrently on view at the Buchenwald Memorial in Weimar, Germany. 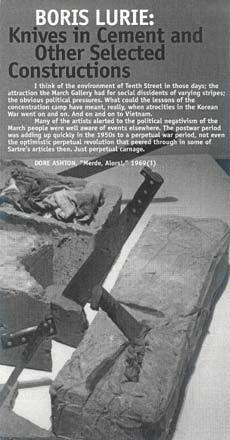 One Knife in Cement serves as signature for this Buchenwald Memorial Boris Lurie retrospective exhibition. Eighty-odd years ago, or more precisely on July 16, 1919, the German National Assembly had convened in Weimar to celebrate the founding of the first German Republic. This event provided "Oberdada" Johannes Baader, historical Dada's most radical iconoclast, with the occasion to enact one of the World War I era movement's most aggressive socio-political interventions. Boris Lurie, in turn, is counted among neo-Dada's most confrontational cultural activists. His work is representative of what Dore Ashton described in 1969 as an art of "social protest and political indignation [directed against a] society which could calmly contemplate [art] while crimes of unspeakable dimensions were being executed every day. "(2) According to the organizers of the current Boris Lurie Buchenwald retrospective exhibition, this event was very deliberately mounted as a commemoration of one of the darkest moments of Weimar's past at the very point in time when the city is again being celebrated as a venerated seat of German culture. Boris Lurie was born in Leningrad in 1924. He was incarcerated in 1941 and transported to various labor and concentration camps including Riga, Lenta, Stutthof and Buchenwald. Lurie was liberated from the Nazi death camps in April of 1945 and soon thereafter emigrated to the United States. Little less than a decade and a half later he became co-founder of the March Group or NO!art collective in New York City. Since the early 1950s, Lurie's work has been exhibited in New York City, Berlin, Milan, Cologne, Paris, Houston and Jerusalem, among other venues. In 1995, his paintings, photomontages and assemblages served as an important component of the Neue Gesellschaft fur Bildende Kunst's commemoration of the closing of the Second World War and of the gallery's opposition, alongside many members of Germany's intellectual left, to a contested Berlin Holocaust memorial. In keeping with The University of Iowa's ongoing commitment to facilitate a cross-cultural dialogue about human rights issues, it is fitting that this small UIMA exhibition coincides with the opening of the retrospective Ban's Lurie: Works 1946-1998 that is currently installed at the Buchenwald Memorial in Germany, the former site of the concentration camp from which the artist was liberated at the age of twenty-one. For the most part, Boris Lurie's works are powerful and troubling indictments of man's injustice to man. His photomontages and assemblages of the late 1950s and early 1960s have recently been described as the most relevant and shocking images of the period. It is these works that make the most direct reference to the survivor's abhorrence of the indifference of the spectator. The works currently on view at the UIMA date from the early 1970s and, although less overtly disturbing, are nonetheless infused with palpable traces of the tracks of the artist's direct experience of one of our century's most terrifying carnages. 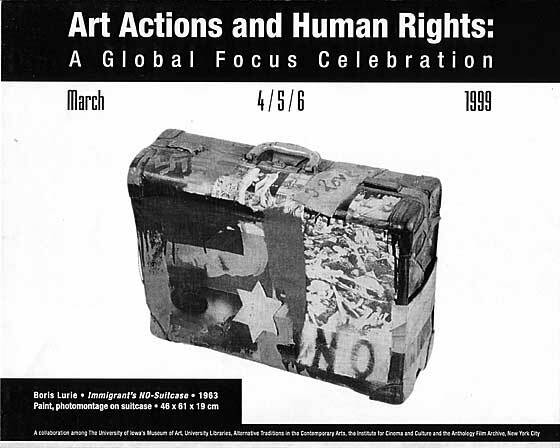 This exhibition is affiliated with The University of Iowa's Global Focus Human Rights celebration which commemorates the fiftieth anniversary of the United Nations' ratification of the Universal Declaration of Human Rights, an international consensus that many scholars argue would not have been achieved were it not for the incomprehensible horror of the Holocaust experience. Upon their return from Weimar in the Fall of 1999, Lurie's work from the late 1950s through the mid-sixties will be installed in the UIMA galleries as one important component of the retrospective exhibition NO!art and the Aesthetics of Doom.